With so much to do in this undiscovered jewel, we’ve composed a travel guide to Marseille France to point you in the right direction. Here is a breakdown of what to do and see in the European Capital of Culture. On leaving the Old Port, you’ll arrive at the Plage des Catalans, a sandy beach equipped with volleyball facilities, a pizzeria and excellent views of the Chateau d’If. Formerly a private beach with a hefty admission fee, it has recently become public and completely free, so a word of warning –in summer, Plage des Catalans can get extremely busy, noisy and littered. The Vallons is actually not a beach; it is a series of small creeks and rocky inlets, from which it’s possible to go swimming and sunbathe on top of in peace. Many have restaurants nearby so you can happily spend the day there, baking on your favourite rock as content as a walrus. If you’re travelling with young children, this beach is a particularly good choice as it’s sandy, protected by a breakwater and lifeguards during the day, and there is a picnic and barbecue area – a perfect way to watch the sunset in summer. This 65 acre park was created in the ‘70s using earth from the excavations for the new metro. The part that runs along the coast plays host to the yearly Fete du Vent, an enormously popular, a celebration of the infamous Mistral wind. The event, which sees colourful kites soaring above the Mediterranean, attracts up to 100,000 visitors from all over the world. Once Marseille’s answer to Alcatraz, the Chateau d’If functioned as an island fortress prison and was home for many an extraordinary guest, including Alexandre Dumas’s fictional romantic hero, the Count of Monte Cristo. When the Chateau was first a fortress, it existed as more of a reminder of royal authority. Its inhabitants included 3,500 French Protestants who earned their keep as gallery slaves and a Monsieur de Niozelles who was given six years for not taking off his hat in the presence of King Louis XIV. Minor misdemeanours such as this were often sentenced with imprisonment – a popular ploy with the wealthier families to get rid of their unwanted offspring without causing a scandal in public. When it later became an entire prison in the mid-16th century, its prisoners were not less astonishing. 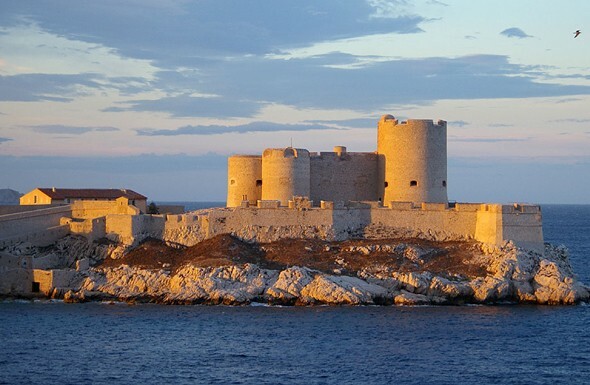 A day trip from Marseille to this fascinating island is well-worth taking. Marseille-based American Retro is not a vintage store as its name suggests, but rather a trendy boutique selling clothes made from super-thin fabrics in a selection of the subdued colours the French make their wardrobe. If you prefer something a little brighter you can head over to Sessun or for more classic pieces, try A.P.C, which has developed a cult following in the U.K. and U.S.
Marseille’s art scene mainly stems from the late Cesar Baldaccini and his Musee d”art Contemporain, a temple filled with neo-realist sculpture. From crushed automobiles to quicksand-like puddles, you’ll find anything weird and wonderful in here. Along the docks of the Old Port is its centuries-old fish market, which sells the main ingredients for the local speciality fish stew, bouillabaisse. Its name translates to its cooking method: when it boils (bouillir), lower the heat to a simmer (baisser). You’ll find this dish in most restaurants in Marseille, but stick in this neighbourhood for the tastiest. For something less traditional, head to Le Ventre de l’Architecte inside the Hotelle Corbusier, where bacon for dessert is just one of the many innovation created by Alexandre Mazzia. Gastronomic treats are met with equally decadent sea views. Visit on one of the two nightly tasting menus, for hints of Asia and the Mediterranean (think shrimp and flower petals bathing in curry foam, followed by papaya sorbet loaded with bacon pieces). Call us on 0207 993 9228 to book your holiday to Marseille France with Purple Travel or see our website for deals.